From heatwaves to intense rainfall and severe cold weather, Europe experiences its fair share of weather extremes. In an open access study, published in Environmental Research Letters, David Karoly and I have found that without limiting global warming, Europe is likely to see even more severe heat, less frequent extreme cold, and more intense rain events. The Paris Agreement of December 2015 aims to limit the global temperature increase to “well below 2℃ above pre-industrial levels and to pursue efforts to limit the temperature increase to 1.5℃”, so as to “significantly reduce the risks and impacts of climate change”. Our analysis compares temperature and rainfall extremes under the 1.5℃ and 2℃ levels of global warming, with these same events in the current climate (with global warming of just over 1℃) and a pre-industrial climate. As the world warms up, so does Europe, although more in the Mediterranean and the east and less over Scandinavia and the British Isles. We studied changes in a few different heat events, including hot summers like the record of 2003 in Central Europe. A blocking high pressure pattern led to persistent sunny hot weather across much of the continent, which dried out the region and enhanced the heat. Temperature records tumbled across the continent, with new national records for daily maximum temperatures in France, the UK and other countries. Previous work has already found a clear human fingerprint in both the event itself and the excess deaths associated with the heat. Our study projects hot summers like 2003 will become more frequent at 1.5℃ and 2℃ of global warming. At 2℃ of global warming, Central European hot summers like 2003 would very likely occur in most years. 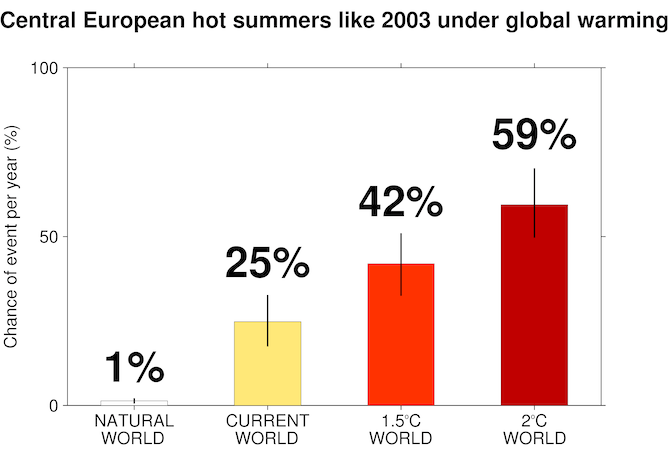 Hot European summers like 2003 become more frequent at higher levels of global warming. Bars show best estimates of the chance of an event per year, with the black lines showing 90% confidence intervals. We also find an increasing likelihood of events like the recent record hot year in Europe in 2016 and the record hot year in Central England in 2014 under the Paris Agreement’s targeted levels of global warming. The December of 2010 was exceptionally cold across the British Isles, as a lack of weather systems crossing the Atlantic allowed air from the north and the east to frequently cross the region. There was a new cold temperature record for Northern Ireland and persistent cold weather across the UK and Ireland, with long runs of sub-zero days. Heavy snowfall caused widespread disruption for days at a time. A snowy scene at Worcester Cathedral in December 2010. Our analysis finds that such a cold December was already very unlikely to occur in the current climate, and would be extremely unlikely under either 1.5℃ or 2℃ of global warming. Future cold weather events would still be associated with similar weather patterns, but the background warming in the climate system would make them less intense than in the world of today or under pre-industrial conditions. We also studied extreme rain events, in particular the heavy rain that led to large-scale flooding in England and Wales in May, June and July of 2007. Low pressure systems passed over the British Isles almost continually for that three-month period, so the rain was falling on already saturated ground. On July 19 and 20 more than 100mm of rain fell on a broad swathe of the English Midlands. This record-breaking rainfall resulted in some of the worst floods in British history. 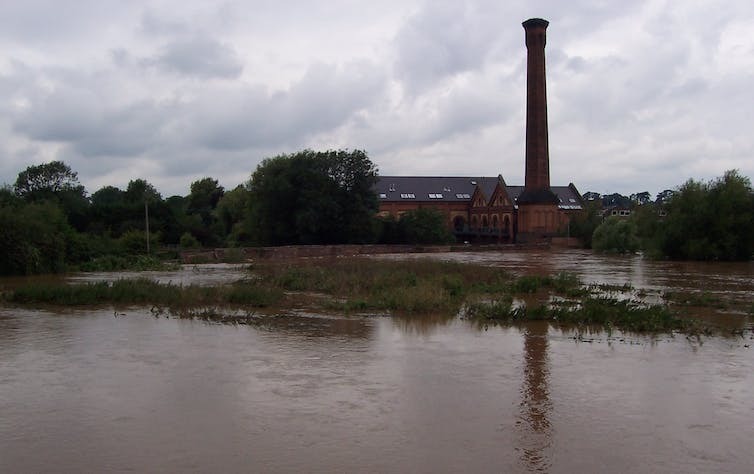 The River Teme near Worcester, England in flood in July 2007. Extended rainy periods like May-July 2007 are very rare, and not projected to become more frequent at 1.5℃ or 2℃ of global warming. However, extreme rainfall days like we saw during that period are projected to become both more frequent and more intense in a warmer world. In a 2℃ world we would expect very heavy rain days to be at least 70% more frequent than in the current climate over the UK and Ireland. Many of the most costly extreme weather events in Europe, in particular extreme heat and intense rainfall events, are projected to become more common, even at the relatively low levels of global warming that are being targeted under the Paris Agreement. More frequent heat extremes expected as the globe warms up. 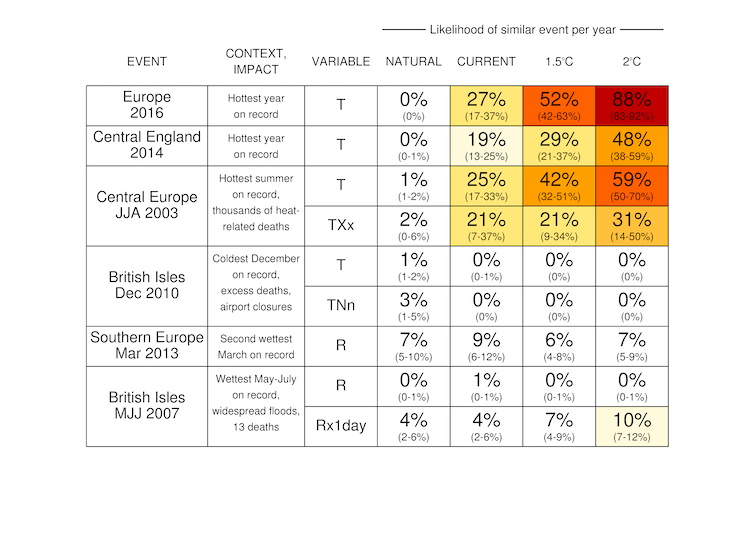 Best estimates of the likelihood of extreme events are shown (with 90% confidence intervals in parentheses). T means average temperature and R means total rainfall. TXx and TNn mean the hottest daily maximum and coldest daily minimum, respectively, while Rx1day means the wettest single day. The worst impacts of these events can be avoided through improving the planning and responses for such events, whether it is increasing support for the elderly in France during summer heatwaves or improving flood protection on major rivers in Britain. However, limiting global warming to 1.5℃, rather than 2℃ or more, would reduce the frequency with which these extreme event responses would need to be implemented. Put simply, to prevent a more extreme future for Europe’s weather, we need to keep the lid on global warming. 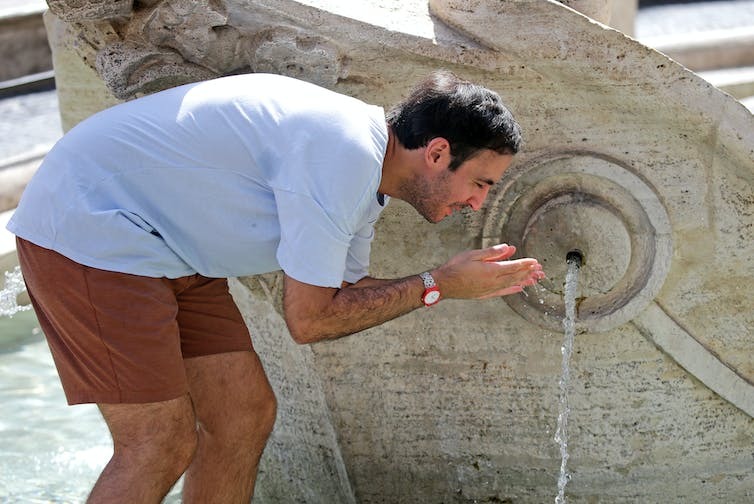 Searching for respite from the heat in one of Rome’s fountains. Parts of Europe are having a devastatingly hot summer. Already we’ve seen heat records topple in western Europe in June, and now a heatwave nicknamed “Lucifer” is bringing stifling conditions to areas of southern and eastern Europe. Several countries are grappling with the effects of this extreme heat, which include wildfires and water restrictions. Temperatures have soared past 40℃ in parts of Italy, Greece and the Balkans, with the extreme heat spreading north into the Czech Republic and southern Poland. Some areas are having their hottest temperatures since 2007 when severe heat also brought dangerous conditions to the southeast of the continent. The heat is associated with a high pressure system over southeast Europe, while the jet stream guides weather systems over Britain and northern Europe. In 2007 this type of split weather pattern across Europe persisted for weeks, bringing heavy rains and flooding to England with scorching temperatures for Greece and the Balkans. Europe is a very well-studied region for heatwaves. There are two main reasons for this: first, it has abundant weather observations and this allows us to evaluate our climate models and quantify the effects of climate change with a high degree of confidence. Second, many leading climate science groups are located in Europe and are funded primarily to improve understanding of climate change influences over the region. The first study to link a specific extreme weather event to climate change examined the record hot European summer of 2003. Since then, multiple studies have assessed the role of human influences in European extreme weather. Broadly speaking, we expect hotter summers and more frequent and intense heatwaves in this part of the world. We also know that climate change increased deaths in the 2003 heatwaves and that climate change-related deaths are projected to rise in the future. To understand the role of climate change in the latest European heatwave, I looked at changes in the hottest summer days over southeast Europe – a region that incorporates Italy, Greece and the Balkans. I calculated the frequency of extremely hot summer days in a set of climate model simulations, under four different scenarios: a natural world without human influences, the world of today (with about 1℃ of global warming), a 1.5℃ global warming world, and a 2℃ warmer world. I chose the 1.5℃ and 2℃ benchmarks because they correspond to the targets described in the Paris Agreement. As the heatwave is ongoing, we don’t yet know exactly how much hotter than average this event will turn out to be. To account for this uncertainty I used multiple thresholds based on historically very hot summer days. These thresholds correspond to an historical 1-in-10-year hottest day, a 1-in-20-year hottest day, and a new record for the region exceeding the observed 2007 value. While we don’t know exactly where the 2017 event will end up, we do know that it will exceed the 1-in-10 year threshold and it may well breach the higher thresholds too. Whatever threshold I used, I found that climate change has greatly increased the likelihood of extremely hot summer days. The chance of extreme hot summer days, like this event, has increased by at least fourfold because of human-caused climate change. Climate change is increasing the frequency of hot summer days in southeast Europe. Likelihoods of the hottest summer days exceeding the historical 1-in-10 year threshold, one-in-20 year threshold and the current record are shown for four scenarios: a natural world, the current world, a 1.5℃ world, and a 2℃ world. Best estimate likelihoods are shown with 90% confidence intervals in parentheses. My analysis shows that under natural conditions the kind of extreme heat we’re seeing over southeast Europe would be rare. In contrast, in the current world and possible future worlds at the Paris Agreement thresholds for global warming, heatwaves like this would not be particularly unusual at all. There is also a benefit to limiting global warming to 1.5℃ rather than 2℃ as this reduces the relative frequency of these extreme heat events. As this event comes to an end we know that Europe can expect more heatwaves like this one. We can, however, prevent such extreme heat from becoming the new normal by keeping global warming at or below the levels agreed upon in Paris. You can find out more about the methods used here.